This letter follows up on the Community Life Council meeting held on April 9. The meeting was very well attended and I am grateful for all those who participated. Of course there are many more cathedral members who couldn’t be there, so, in the interest of transparency, this letter contains the gist of my presentation. I apologize for its length, but there is a lot to share! Although we expect to close on the land sale very shortly, our operating expenses will still exceed our income, as has been the case for several years. Chapter is planning for a reduction in our operating expenses of about $150,000 in 2020, in order to create a balanced budget without drawing from reserves. We are aiming for values of transparency, engagement, sustainability, and transformation as we plan and communicate this adjustment. The adjustments touch most ministry areas, but especially Spanish-language ministry, formation, hospitality, and worship bulletins. We will, with great sadness, lose two part-time staff positions and reduce another, but Chapter has emphasized the priority of people over paper and has chosen an option which minimizes staff impact. Even though this is painful, we see opportunities for positive growth in our community and fellowship. First the good news: we are staying on budget for 2019 (Thank you for keeping your pledge gifts up to date!) and the land sale will close very soon, possibly before Easter. That sale will add about $7 million net to the combined resources of the LLC and the cathedral; in fact, for a couple of years we will have $8 million in the bank (until we make the tenant improvements in the new building and start paying HOA fees). Holding back for contingencies during construction, and following our longstanding policy of drawing 5%, we will receive between $320,000 and $350,000 annually from the LLC to support our budget. The not so good news is that we are still dealing with about a $150,000 gap in the anticipated operating budget for 2020 and beyond. For four years we have intentionally drawn amounts between $120,000 and $185,000 from our reserves to balance the budget, doing our best to keep doing business as usual. This year the LLC gave us an additional $100,000 from reserves to compensate for the loss of Park Chateau rents. At this point we have spent over $800,000 that would otherwise have gone into our invested funds yielding $40,000 per annum indefinitely. Clearly this policy of borrowing from ourselves is not sustainable. We had hoped that our income would rise to fill the gap, but it hasn’t. You know that Chapter has made a commitment to “rightsize” the budget going forward, so that it balances without cannibalizing our resources. We’ve come to the point where we are preparing to bite the bullet and make expense cuts adding up to about $150,000 in 2020, that will accomplish a sustainable budget. Coming up with a plan has been hard and heartbreaking work, and I am proud of our executive staff, officers and chapter for working in a collaborative and supportive way. Remember, this isn’t the final 2020 budget, it’s a strategic plan to guide decisions and directions throughout the rest of this year so that when the time comes to form the 2020 budget in the fall we will know where we are going. We are also thinking about how we will have to downsize in some respects as we enter the construction phase and have less space to share. We will continue to do everything we can to support core ministries: our wonderful, traditional music and worship, our care for one another within the community, our outreach efforts especially Showers, and our passion for social justice and equal rights. We will value and prioritize our staff and members wherever possible, choosing people over paper, so to speak. If we reduce the number of staff we will not add to the workload of the remaining employees, all of whom are already stretched. Let me stress: this is hard stuff. It makes my heart ache. At last week’s Chapter meeting each member expressed their reluctance and pain over the proposed measures. We would all rather not be doing this exercise. But we came to consensus over a plan in the end, because we had to. Your Chapter is demonstrating wisdom and responsible stewardship in approving the plan albeit through gritted teeth. We are grieving and you might feel some grief too. Give yourself permission to do so and feel free to seek out a Chapter member or clergy person to whom you can express your sadness. Our treasurer, Betsey Monsell, has the numbers that add up to the required savings, and she will be glad to share those with you on request. As the numbers are constantly shifting as circumstances change, it’s best not to enshrine a particular snapshot of the plan online. The plan necessarily includes some added expenses that have to be covered, such as the cost of trash removal (we can no longer put our trash in the Park Chateau containers), and a 2% cost of living increase for staff. It also includes new income from the music endowment (please help us to build up the principal!) and from a San Diego Foundation grant established by the legacy of a parishioner: we only recently learned of this annual grant. We will be able to cancel one of our large copiers when the lease expires in the middle of next year. But the bulk of the changes affect four ministry areas: Spanish-language ministry ($46,432), formation ($36,621), hospitality ($15,000), and worship bulletins ($10,000). The most painful part of this plan concerns its effect on our people. We are eliminating two staff positions and reducing one. We have a great staff of talented and hardworking people. Losing anyone is like a death in the family. All the employees affected have been part of the conversation as we have searched for solutions. Each is affected differently. The loss of staff resources will mean a change in the way we do ministry. There will be more of an emphasis on everyone doing ministry, rather than having the staff do it for us. This will be an adjustment. But we can do this. We are in a healthy place, with engaged parishioners, well-controlled finances, and we are all dedicated to our core ministries of loving, serving, and welcoming. And, when we move into the new building we will be ready to spread our wings and expand into the new space. This ministry has 20 years of history, always relying on supplemental funding from the diocese and other sources. 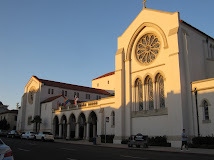 The demographics of Bankers Hill have changed in those 20 years: our Latino parishioners now come a long way to the cathedral. It is no longer a ministry to the neighborhood. The Spanish-language service attendance has been dwindling in recent years. Nevertheless, it is a valuable ministry and I want it to continue. How can we continue this ministry in a sustainable way? Move from 1 pm Sunday to 5 pm Saturday, making it bilingual, multicultural, with me presiding and preaching half the time, others in rotation, bilingual bulletins and the service in the language that the presider can offer. This just came up: a Latino friend, retiring as a theology professor, experienced preacher, has offered to do at least half of the preaching if we keep the Spanish service on Sunday afternoon. He feels passionately that we should do this for the Misa families. I am currently weighing the benefits of this against the additional burden on remaining staff on Sundays. I am inviting input from Misa leadership and executive staff about these options. Whatever option we take, we will eliminate the Latino missioner position, which sadly means we will lose Fr. Carlos. We cannot support his position under the current circumstances. Carlos has been involved in the conversation, and he will be appropriately taken care of: this means a relatively long notice period and a departure package. He has several spiritual and logistical supports including myself and diocesan transition resources. We will also eliminate the Mariachi musicians and look for a smaller, much less expensive music option. Rather than make the change on January 1, in the middle of the program year, we are going to make this transition in the summer. Carlos’ last day at the cathedral will be June 23. We will reluctantly eliminate the position of Director of Formation, currently held by David Tremaine. None of us, including David, are happy about this decision, but with your help and leadership we can continue to provide formation programs for all ages. We are already underway in transforming formation ministry back to where it used to be, with strong volunteer leadership. David has been included in the conversations and has been actively building up the committee leadership for both adults and families. He will continue this effort throughout the balance of the year and the committees will take over more tasks. David is a remarkably gifted individual with a strong theological education and the kind of entrepreneurial spirit that the church really needs. I am confident that wonderful new opportunities will open up for him. He and I both wish that one of those opportunities were here. Chapter decided to hold onto the Faith to Go program and the nursery - so important for our young families. But I am looking into handing off Faith to Go to the diocese. It’s too good an idea to keep to ourselves. At this moment I don’t know which staff member will take over supervision of the remaining CYF staff, Maya, Jackie, and our two nursery staff. As with Carlos, we will take care of David. None of us want to see anyone out of work. Chapter will again make sure he receives an appropriate package. The goal is to transform this ministry to focus on community leadership and involvement. The cathedral currently spends $50,000 on food and social events but receives only $8,500 in food donations. Cathedral staff do much of the food preparation. We will create a hospitality committee to lead this ministry. This will be largely parishioners who will coordinate food and beverage donations, run ticketed fellowship events that pay for themselves, and build community through shared meals. During construction we have an opportunity to encourage regular events in parishioner homes, as the cathedral campus will be challenged with regard to meeting and parking space. Please contact Kathleen Burgess if you would like to participate in this ministry. The hospitality committee will play an important role in nourishing our community and keeping bonds strong. We estimate that we spend well over $10,000 on the printing and paper for service bulletins. And the preparation takes staff and volunteers a tremendous amount of time that could be spent doing other things. Right now we have 18 bulletins in the pipeline for Holy Week and beyond. Brooks spends about half his time doing bulletins; he could be doing pastoral care. Martin, who also spends a significant percentage of his time on bulletins, could be planning a concert series. Additionally, Judy, Gabriel, Bob, Alan Sparks, Anne Walter and I all spend significant time on bulletins every week. We will radically reduce our dependence on customized bulletins. We will reintroduce the use of the Book of Common Prayer and the Hymnal. We will come together to help each other find our way around the books: a community-building exercise. Watch for forums and classes! This is something the last General Convention encouraged us to do. The argument over bulletins is an old one - more elaborate bulletins are more welcoming to visitors but are environmentally problematic as well as expensive; but given the difficult options available to us, Chapter chose people over paper. Transparency: we are working to help the entire congregation stay on the same page: efforts include my weekly letters, occasional e-blasts on special topics, these quarterly CLC meetings. The objective is to help you know and understand what’s going on in your community, and giving you a voice in decisions. Ownership/engagement: this is YOUR church. Get involved! Dive in. Show up. Help out. Stay informed. Ask questions. Take the initiative in inviting others to get involved. Spread a positive message about St. Paul’s through social media and friends. Help those who look perplexed or lost. Attend a Chapter meeting. Stand for election to Chapter. Sustainability: Chapter’s focus is on sustainability this year. We have been intentionally living beyond our means for four years, dipping into reserves to subsidize the operating budget. In fact, we have been living beyond our means for much longer, but it’s only been in the last five years that we have come to a place of fully understanding what we have or don’t have. Transformation: the world is changing, the social context of the church is changing, and we need to embrace change too. While our principal worship services and music will continue at the very polished, professional level that we all love, our community life is going through a transformation. We are letting go of the old culture of highly polished social events in favor of less tidy but more vibrant communal efforts. We are looking to build community through our fellowship. If our reason for being is to build relationship, we will do that better by all mucking in together rather than by being customers served by the staff. For some this will mean hosting a summer social, for some cooking a lasagna or baking a cake, for others helping to set up or tear down an event. Help St Paul’s develop an ethos of universal ministry: everyone is a minister and has something to offer. Again, these adjustments are painful for all of us. I value the collegiality and collaboration with Carlos and David. We will all miss them. The development of this plan has been a corporate effort by all the cathedral leadership, and we’ve done the best we can. Now it’s time for you to help us. Please let leadership know how you feel about these changes, and please offer alternative solutions if you think of them. You can email Jeff, the wardens, or me, or make an appointment with one of us. If you need to lament, that’s OK. If you would like one of us to meet with a ministry group, just say the word. We are currently in the first half of April, and we won’t vote on the 2020 budget until the end of the year. Chapter’s plan is a guide for making decisions throughout the year so that when January comes we will be better prepared; and it is flexible, not fixed. There is plenty of time for circumstances to change and for new ideas to come forth. This is the time for each of us to offer creative solutions for consideration. About 25 people were involved in creating the current plan, and that’s a small percentage of the brainpower available in the congregation. Every idea will be taken seriously. Thank you for your thoughtful support as we prepare to make these necessary changes. I wish you a blessed Holy Week and a joyful Easter. Thank you, Dean Penny, for your thorough and clear description of the steps Chapter has carefully considered and chosen to meet our structural budget deficit. It must have been so very difficult, but I know it had to be done. Your leadership in the face of adversity is greatly appreciated.